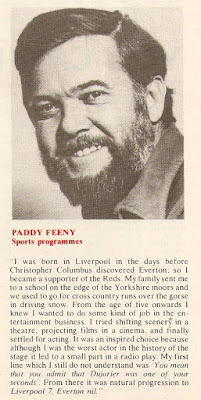 Listeners in far-flung corners of the globe tuning in their short-wave radio sets to the World Service 30 or 40 years ago would, no doubt, if asked to name a voice who represented the BBC, who was the authoritative voice of Britain, have suggested Paddy Feeny. For 36 years on Saturday afternoons he guided overseas listeners through the myriad of sporting events and fixtures on Saturday Special. “It’s a combination of timing, co-ordination, understanding the subject and a pinch of telepathy" he explained in 1993 just two years before he stood down. 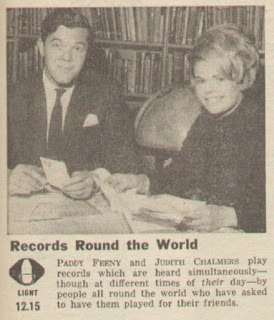 To listeners and viewers at home, however, Paddy's talents as a presenter were aimed at a younger audience; from question master on the inter-school quiz Top of the Form, narrating programmes for schools, presenter of Young Scientist of the Year, and in the process making a unlikely TV star out of boffin Professor Heinz Wolff, to spinning the discs on Junior Choice. Paddy was born in Liverpool in 1931 and educated at Ampleforth College in North Yorkshire. "From the age of five onwards I knew I wanted to do some kind of job in the entertainment business." His first job was as a film projectionist and he progressed to stage electrician, stage manager and "an extremely bad actor" Having passed a BBC audition his first broadcast was in the radio play Duel of Honour for the BBC in Birmingham in 1952 where, he later recalled, his first line was one that years later he still did not understand: "You mean that you admit that Dujarier was one of your seconds." 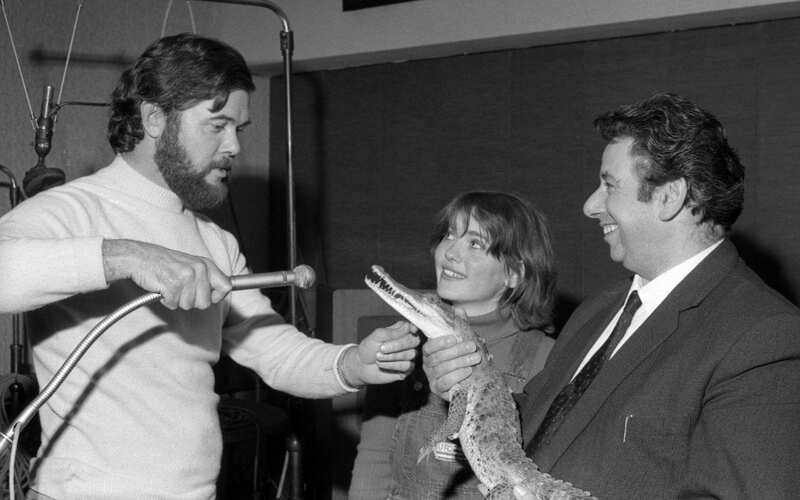 After a spell in repertory he joined the BBC's European Services as a studio manager. By a stroke of good luck the sports producer was looking for someone to present the summer sports coverage, step forward an enthusiastic Paddy Feeny. On 9 May 1959 from studio C21 in Bush House he first presented what turned out to be a regular gig for the next 36 years. Eventually Saturday Special extended its hours and became a year round fixture in the schedules rather than just a summer event. 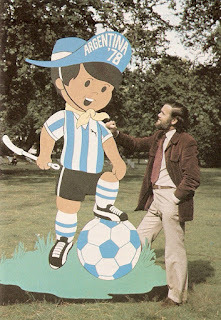 The World Service employed its own sports team but also shared coverage with the domestic sports programmes on the Sports Service (later Sport on 2 and Sport on 5) with commentators regularly welcoming "listeners to the BBC World Service." Here's Paddy in action on 9 April 1988. As early as 1963 Paddy began his association with Top of the Form, initially alongside Geoffrey Wheeler for three years on the BBC TV version (1963-66) and then a longer run on the radio version between 1978 and 1985, sharing duties with Tim Gudgin. This edition of Top of the Form dates from 28 October 1980 and features a contest between Hessle High School and Hornsea School and Institute of Further Education. Records Round the World was a long-running BBC World Service show. On domestic radio Paddy occasionally presented Children's Favourites and looked after its successor Junior Choice between Leslie Crowther and Ed Stewart (1967-68). He teamed up with Judith Chalmers for Records Round the World (1966-67) a weekly World Service/Light Programme simulcast. Together with Tim Gudgin and Bob Holness he introduced the Home Service regional opt-out news bulletin South-East (1967). Further radio appearances for the junior end of the listenership included various schools programmes, the Saturday afternoon compendium 4th Dimension and the Radio 2 natural history quiz Give Us a Conch (1984-85). On BBC TV Paddy was best known for Young Scientist of the Year (1966-78 initially billed as Science Fair), a series that must have spurred many a budding scientist to experiment in the school science lab. When all this other work fell away Paddy maintained his position at the helm of Saturday Special until his final show on 24 June 1995. He also appeared on the World Service series At Home with... (1984), the sports quiz Game, Set and Match (1993-95) and the station's Feedback equivalent Write On (1987-96). Here's an edition of Write On from January 1996. Paddy died earlier this week after a short illness. Mike Costello paid tribute to him on the BBC World Service. I used to love listening to Paddy on Saturday Special via the World Service on shortwave throughout most of the 1980s and early 90s. I had no idea that he had been gone from that particular gig for over 20 years now. Very sad to learn of his death. Thank you so much for this lovely tribute. I started listening to Saturday Special in the 1970s and the comment in Mike Costello’s tribute about feeling connected to Paddy Feeny was absolutely true. I recall listening to Paddy in the middle of a desert in the late 1970s. The finest and sharpest broadcaster ever. Such a wonderful distinctive voice and so spontaneous. Sadly missed. Liverpool breeds these people. 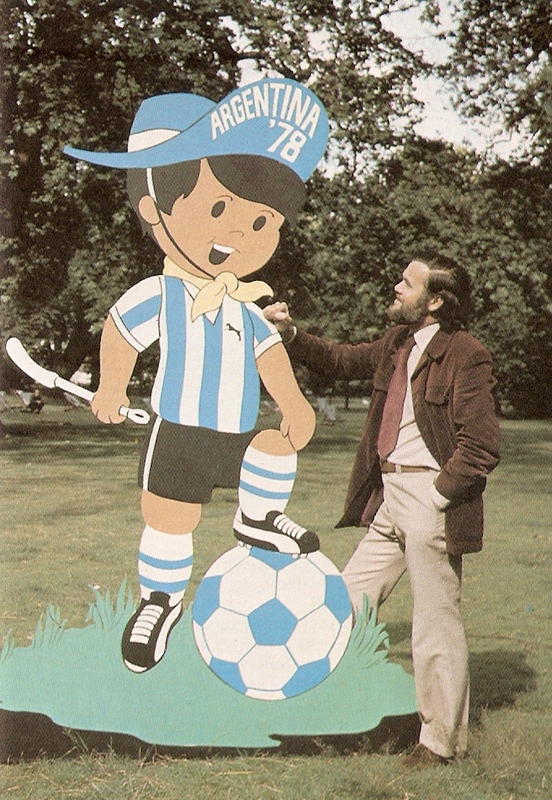 Not mentioned here is that he wrote and narrated the 1976 Radio 4 series 'We Taught the World to Play', in which Britain reassured itself that it had invented sports that it had mostly stopped being good at.